Remember last week when the new exercise program started? Well to mow the grass where we park I had to move our pick-up. Went to start it and it went RRRRR, RRRRR, RRRRR, but no VROOOOMMMMM... I'm sure you've heard those fateful noises once or twice. Usually in conjunction with miserable weather or when time is of the essence and you are already late. In this case it was something about not running it for a while and the battery goes dead. No problem though. Got the jumper cables out from behind the seat, popped the hood on the pick-up, propped up the hood with the hood propper, hooked the jumper cables to the battery, pulled the Cherokee up to the pick-up, popped the hood, opened it, let it go (cause it has those nice gas struts to hold it open) and down it came like a guillotine. So I lifted the hood again, stood back, let go. Down it came like a guillotine again. Had my car been possessed? Could this be a maniacal car wanting to decapitate me? Should I check the title to make sure the last owner wasn't 'Christine' King? Not to be outdone by a possessed car, I grabbed a hunk of 2x4. Opened the hood slowly, quickly shoved the 2x4 in and let go. AHA!!!! the hood remained open (but thought I heard some straining sounds near the 2x4). The middle of the story is dull until this morning. I had called my good friend (especially when I have my credit card in hand) Woody who said 'bring'er in an we'll have a look'. So off we went this morning to solve the decapitation by auto problem. Long story short, they replaced the struts, they did an all point checkup on the cranial separator and found a burned out stop light (most likely the root of the whole problem) and replaced it, they even vacuumed out the car (a possible cause of new problems). When I got home I found that the replaced stop light is not working again. I'm sure it is some sort of vicious scheme to lure me to open the hood so the beheading can resume. Tomorrow I'll hang garlic in the car and hope Beatrice can handle it. Wednesday we will stop to see Woody!!!! Kildeers are shorebirds you can see without going near water and if you lived near the F&P, you could see at least 3 of them near the RR tracks. 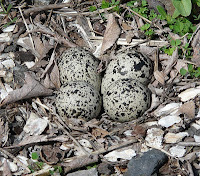 They nest on open ground, usually gravel and are not all fussy about their nest, usually just a slight depression in the gravel to hold the eggs. 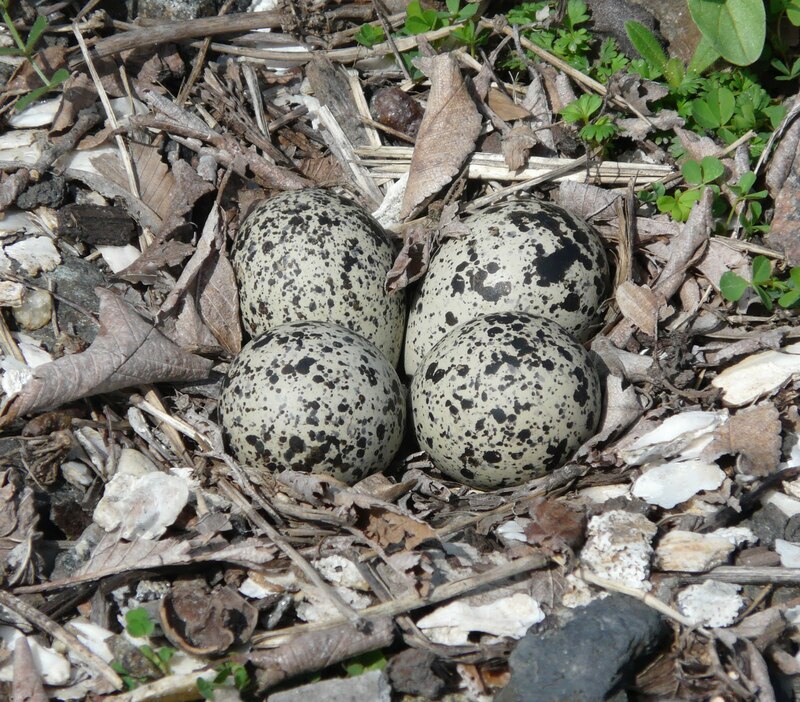 Their nest blends into the surrounding area and the speckled eggs look like stones so that you really have to look hard to spot it. 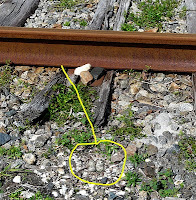 And, this morning, Grenville and I found this nest in nearly the same place as last year's - right alongside the RR tracks. 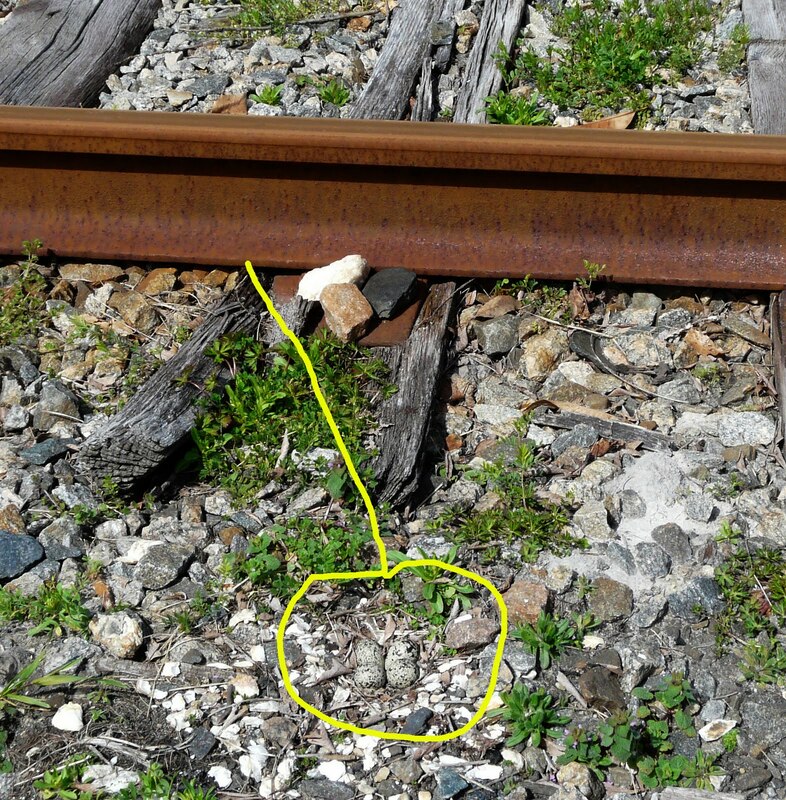 It's hard to spot the nest in the photo on the right, even when you're walking along the tracks, so the photo on the left is a close-up with 4 eggs, like last year. 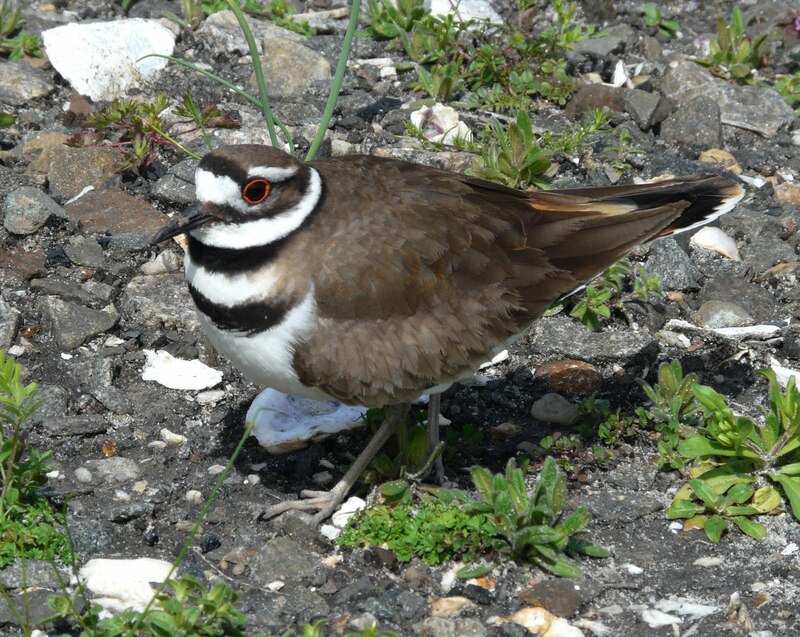 And, as if nesting in plain sight wasn't interesting enough, here's another fact about kildeer. They are great scam artists and fake injury to deter intruders, usually it's a broken wing. 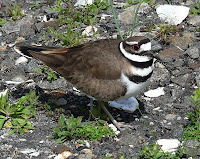 The bird limps along dragging its wing on the ground. The moment you try to help or follow the bird, it recovers and moves on and when it senses that the nest area is safe, its broken wing "heals" and the bird flies away, calling a loud "KILL-DEE" sounding more like a jeer. 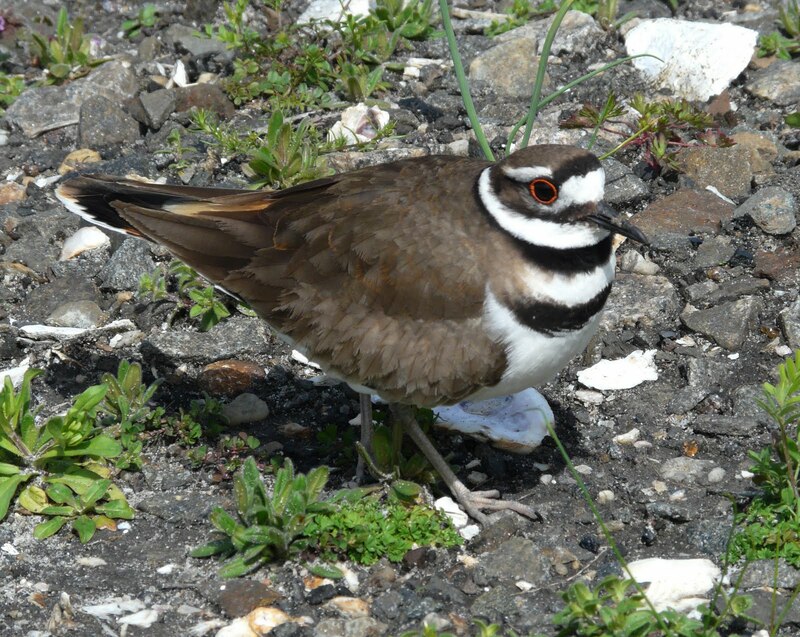 We're not fooled by this faked injury, but the killdeer doesn't know we're onto its act. So, we play along and continue walking. 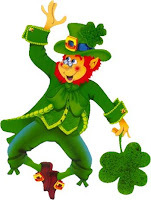 As i have said in the past, i really don't dance very well and the weather has been rather wet here so i've been in a conundrum (sort of like those winter doldrums that cause cabin fever or is it the other way around?) as to when to start tilling. BUT yesterday the back field felt sort of dry enough to work. SOOOO after breakfast i went and hitched up the tiller to my friend JD and we headed down to the first field. Now we covered the fields last fall with pine straw to keep down the weeds since we have mild winters here on the Shore. Seldom does it get below 20 and a hard frost is a rarity. This leads to a prime time for weeds in the tilled areas. AND the pine straw makes for some great compost when it is turned in. SOOOO very gently JD and i started into the first plot and found the going less that perfect but still doable. 3 hours later we were done with the 4 plots we will work this year, Widened each plot by 2 feet, and cleared an old plot so it is ready for overseeding and fruit trees later this season. The down side to all of this was the temperature. Last week had been in the 70's and clear. Yesterday morning broke at 31 deg, breezy, and a light frost. One of the popular Shoreisms is "If you don't like the weather now, just wait twenty minutes". This is definitely an area of serious changeable weather. With luck, the forecast rains over the next few weeks will perk in but the tilling will let the surface dry a little quicker. Ground temp this morning is down to 49 deg. Tomatoes, Peppers, and Eggplants are doing well. Broccoli and Cauliflower have not sprouted yet. Wait a minute, the sun is coming out so I guess it should be "Sunshine on my shoulder makes me.." Oh No, dark clouds coming in from the west.... This is going to be one of those days. So my original decision to stay in my Jammies all day long is final. BUT lots has gotten accomplished lately. I tried out my idea to get more exercise by using a push, well pull me along, mower to cut the back field and now know that i can accomplish it in a mere 3 hours. AND that included a few water breaks. So now I know what will be on my Friday aft ernoon schedule. The soil testing turned out to be a waste. The kit was old and nothing came out so a new one gets ordered today. What i did find out is how really really wet the soil is under the pine straw. After much though and deliberation we may try tilling just the first plot tomorrow by staying on the pine straw so we don't sink into the soil. That should mix in the pine and open the soil to better drying. Oh yea, we have had .66 inches of rain so far this morning and are due for more this afternoon. Planted 6 Broccoli and 6 Cauliflower this morning so i will have a little head start when we finally put them out. BUT that will not be until after Easter somewhere around the 15th of the month if the soil warms up a little more. So far it has been holding between 52 and 55 degrees (54.0@0930hrs). Tomatoes are doing well and are almost ready for repotting. Peppers and Eggplant were repotted this week and are doing much better in the BIG pots. Beatrice has had a Chicken simmering all morning and it smells like it needs taste testing. More later. Roasted chicken was on tonight's dinner menu along with some fresh steamed asparagus. We forgot to have the camera ready for the roasted bird's "photo op" but trust us this was a good looking bird and delicious too. OK, so there's no secret to roasting a chicken and information is printed right on the packaging. But, what's NOT there is how to season it. Today was a chilly day outside, but inside the F&P the roasting fowl smelled great. Are you ready, here's my not-so-secret method (especially not after posting here). Wash off and then soak the chicken in salted water for at least a half hour. Chop up some rosemary (preferably fresh) and several garlic gloves, and mix together with a bit of olive oil to make a paste. Drain the bird and towel dry. Season the inside with pepper, salt and poultry seasoning. Cut a small onion in half chunk it. Put some inside the cavity and some at the bottom of the roasting pan with about a cup or more of water - enough so the bottom is covered - amount depends on the size of your roasting pan. Tuck the rosemary-garlic paste under the breast skin. Coat the skin with olive oil, sprinkle some paprika (smoked is nice) and put in a 350° oven for the recommended cooking time. Use a thermometer to test for doneness - 185° and the bird is cooked (drat, wanted to say goose). Roast the bird in an uncovered stainless steel roasting pan for a crusty and browned skin - paprika and olive will do that nicely. Just set the bird on a rack so it doesn't rest in the drippings. And, we know you are warned not to eat the skin, but honestly WHO hasn't ever not done that. Tomorrow, the carcass will be used for some homemade chicken soup. Spotted this sign at the flea market in PA and thought of a couple of ? Do you have to climb the fence to use it? There was barbed wire at the top of this fence...ouch! What a day. We all decided that we needed some new fleas (Youngest Daughter said hers were dirty). So off we went to the market and got to see colorfully dressed and pierced folks sporting some very exotic body art. We roamed and had a great time. Lunch was a real surprise. We slide into a cute little greasy fork (not quite up to spoon level) and ordered some of the more exotic local foods. After some time, our server came back and apologized about the long wait but someone had forgotten to go catch another Dog so our Hot Dogs would be slightly delayed. We were assured that the offender was being flogged as we waited and if we wanted we could go observe. We declined blaming empty stomachs syndrome. When our lunch did arrive, our server announced that it was "on the house" due to the delay. I realized this was literally true on my third bite, finding a piece of shingle left over from breakfast. But all of this was just an overture to our introduction to the National Sport of Mooorocco. Now being in the Cud Chewing Capital of the Country one would suspect that this sport would include the skill involved in balancing Bovines, or the ability to sail Cow Pies the furthest, maybe even Amish Buggy Death Racing. Alas it was none of these exciting, under appreciated, and little known sporting events. As mentioned prior diner was Youngest Daughters treat at a recommended Italian spot. To make it short, the eatery did not live up to it's reputation. Of course with Beatrice and I not many do make the grade above adequate. But the company and the banter made up for the lack of gastronomical excitement. a second Zantac when we got back to our room and it was off to la la land. Today is the final leg back to the Frog and PenguINN after 6 days on the road (and I'm gonna make it home tonight!!!) Sorry 'bout that little song attempt and apologies to Hank Snow. Well morning broke early. At least that its what someone told me since I was deeply involved with my pillow. But it is almost like being at home in spring. Just Ode du Bovine instead of Chicken Delight. Right now we are having breakfast with a family of about 50 or so ranging in age from Gramps to obnoxious little kids that need to go play in the elevator pit. BUT the breakfast was passable here. Cheese omelet, sausage, muffins, fruit, All of which was frozen and then re -nuked. At least it was not all carbs. We on the other hand are heading over to Youngest Daughters and heading out to the Farmers Market and then to a Nature Preserve she has found. Dinner tonight is her choice of a new place she wants to try. Weather has really fooled us. Didn't need the sweatshirts and glad I have some nice tee shirts, but should have packed a polo or two. Soo we are off and running for the day. They say that the world is getting smaller and I have to agree. We may be separated by even less than the reported 6 degrees. Where we stay is close to the airport and has a lot of airline personnel staying there. We like to ask what "exotic" destinations they are heading for. Yesterday one attendant was on her way to Aruba. NICE!!!!! This morning as we were having breakfast Beatrice started a conversation with one of these folks. He was going to Manchester New Hampshire on a commuter run. Somehow it came up that we live on the Shore, and he happened to have a cousin that lived there. To make a long story short, we know his cousin. He was amazed!!!! This afternoon as we were approaching the bridge over the Delaware River the traffic came to a halt. The signs ahead said that there was construction at the toll booths after the bridge. We were in the center lane and the fellow next to us in the right lane rolled down his window. I guess he noticed we were from out of state and took pity on us. He told us that the fastest lane over the bridge was the right, and then to get into the center going through the toll booths. Just to follow him. As we crept along the signs announced that the 2 left lanes (out of 3) were closed. So we followed close and he got us through it all. So two chance meeting added a little fun and happiness to the day. A day that has been a long one which is why this was not very humorous. I'll try to do better tomorrow after a good nights sleep. Bob and Bing may have had the road to Morocco but today we are heading down the highway to the Land of Moo. 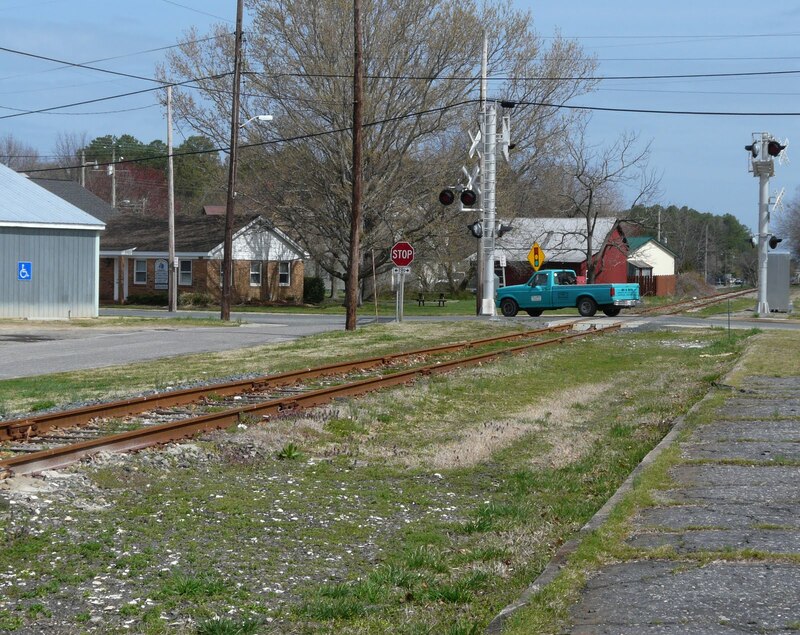 We have decided that the urban life has definitely been purged from us and we long for our ruraldom of the Shore. BUT today we will make a side trip Lancaster PA to visit with Younger Daughter (Princess Sleeps Alot) and BoyFriend. We heard that we are going to do some Farm Markets and then dinner at a Italian Restaurant she has heard is really good.... AND we get to see lots of COWS, Bodacious Bovines, and Contented Cud Chewers. More from the road if we find a wi-fi spot among the silos and soggy fields. I was going to add an audio clip of me singing "On the Road Again" but Willie emailed and said it was not a good idea. Spring was definitely in the air here today. Grandson Bubba took us to the park and slid every slide, swung every swing, climbed every climber over and over and over again. As we are getting ready to leave the Carousel, which had a sign on the door that it was closed except for the weekend, all of a sudden was open and twirling with the horses galloping and Calliope playing. From there it was off find some pizza for lunch, and then home for some naps. All in all a pretty good day. Of course Beatrice and I will be sleeping really really good tonight. BUT Beatrice, being the great photographer she is, was able to get some shots of the Corned Beef before it was devoured. Grandson Bubba helped me fix dinner. Of course after his help we were quite a few carrots short, but we made it. The family descended about 4:30 and the merriment and excitement flowed till the wee hours of the evening. Unfortunately, son in law had to go back to work. Something called INVENTORY.... I think this has to do with inventing something, or maybe venting or some other high thinking activity. Today Bubba and I and Grandma are going to the park to count birds and chase squirrels. We've told you that we live in a small town. There are only 500 residents here so almost everyone knows everyone else. As new comers (or comehere's as the bornhere's call us) we have met quite a few folks. Actually more than I have ever known anyplace I have lived. Most are very nice, some are down right wonderful, and a few are less likable that others. But you don't really have to know someone here to be friendly. As we walk in the mornings everyone waves to each other whether thay are walking, driving or whatever . Doesn't matter if you actually know them or not it is just what is done here. Folks also tend to look you straight in the eye. YES they make "EYE CONTACT". They say hello. They ask 'how are you today' and really mean it. 3. and most importantly say a pray not just for you but with you. Life is good, and we thank you Lord. Hey folks, we are off on another road adventure. We left the ES this morning around 9:30 and are heading north Rhode Island to spend the High Holidays with Grandson "Bubba". Oh yea, his parents and some cousins will be there too, but he is the important one. At the moment we are just finishing dinch (lunch/dinner) or lunner depending on how you look at it. We are at a Panera Bread in loverly Darien Conn. We have a wonderful view of US RT.1 or as it is known here "the Post Road" since this was the only main road between NY and Boston during Colonial times, thus the Post (as is postal) road. Hopefully we will make it to Warwick RI and our hotel with that nice soft comfy bed waiting for us in about 3 hours or so. Banana bread is fast becoming a favorite easy recipe because, Yes we have some bananas and overripe ones too in the F&P kitchen. And, just like meatloaf recipes, there are lots of banana bread recipes. A couple of weeks ago, I posted a "quick and easy" banana bread recipe, but Grenville, the F&P official taste tester, thought it needed to be moister, so here's an updated recipe. This one includes some things the earlier one didn't include: baking soda, yogurt (plain), and oil. If you don't like nuts, then skip them. One more thing, we had LOTS of ripe bananas (6), so this doubled recipe makes 2 loaves. One to give away and one to keep because we had to taste sample one - it passed! Preheat oven to 350°. Grease 2 loaf pans (8 ½ x 4 ½ x 2 ½ in.). Mash bananas, then add eggs, vanilla, oil and sugar. Stir together flour, baking soda, baking powder, salt, cinnamon, nutmeg. Add banana mixture - then add nuts and blend. Divide batter between loaf pans. Bake for 1 hour. Remove and cool on rack. Funny how you never know how many clocks are in your house (and cars) until they all had to be reset to spring forward last night. But, here's an easier and prettier way to know that SPRING is here...the crocus (crocuses, croci?) is in bloom! Finally, it's sunny out today, but not for long. In the past 10 minutes, the skies have clouded over and the rumblings have started. Thunderstorms are on the way - AGAIN. The overnight rains included a couple of thunderstorms with some really loud claps and not the applause ones. Last night's downpours added to already waterlogged front and back yards, as we saw on a morning walk around the neighborhood. The F&P backyard is very soggy and it will be awhile before spring planting starts. Speaking of gardens, here's a neighbor's that's all underwater, but the reflections were pretty nice. Other backyards were turned into waterfront scenes which are scenic, but not for the homeowners. This picture was taken just down the street near this sign... Ya think? It was only a brief appearance, but still the sun came out for awhile today and so did some clearing. There were actually patches of blue sky. Grenville posted photos from our waterlogged backyard earlier, but we weren't the only ones to get saturated with this latest round of downpours. Several folks in our neighborhood can now boast about having waterfront property -not sure they would consider this a "plus." As Grenville posted earlier, the past 48 hours have brought a LOT of rain here with more showers forecast for later this afternoon and evening. So when the sun made its brief appearance today, that's when I grabbed my camera and walked around the neighborhood to capture these images. OK OK OK so the poetry was not up to my usual low standard. It is not easy. BUT that is just the kind of day it is here. Since this started on Thursday night we have had 2.21 inc hes of rain (now 2.24). This is on top of the 40 or so inches we have had this winter. On the bright side I have a new Johnny's seed catolog with lots of info, the rest of the tomatoes are popping up, and I have a good book for later. AND the princess has decreed that all subjects should stay in their jammies or sweats today and eat chili soup later on. The question of the day is: how deep do tomatoe plant roots go? If left alone after planting will they stretch down to the water table which is usually about 2-3 feet below surface? Yesterday the Princess let me in the kitchen and I got to cook dinner. I had found a recipe on the Old Farmers Almanac site for Sweet and Sour Pork that used Maple Syrup, one of my favorites. The problem was that I didn't have the Country Style ribs it called for, only pork loin. And I didn't want to make this for 12 folks, just us two. So some re-engineering was called for. If you would like the original go to http://www.almanac.com/ and look in the recipe section for Sweet and Sour Pork. Here is my version. This will feed 4 normal folks (we have left overs for tonight) and 2 very hungry folks. 1/4 cup each of chopped celery, green pepper, and red onion. Brown the chops in a medium chef's pan (you can add a little olive oil if you like). Remove the chops but save the drippings. Combine the flour with enough water to make a nice thin paste. Add this to the drippings and make a medium rue. Put the chops back in the pan. Add all of the remaining ingredients. Mix them around so the chops are covered in juices. Simmer for 45- 60 minutes until the pork is done to your liking. I like mine moist and a little pink. Serve this over a nice bed of rice of your choice. I did some brown rice but wild and long grain will also do. I served this with some reheated Oven Roasted Veggies and fresh steamed asparagus. There they were just sitting in the fruit bowl – 3 slightly overripe bananas and I could almost taste them in a freshly baked loaf of bread. But, Grenville had just used the remaining milk on his cereal, so I had to find a recipe which did not use milk...here it is from The Fannie Farmer Cookbook. Preheat oven to 350°. Grease a loaf pan (8 ½ x 4 ½ x 2 ½ in.). Mix bananas and eggs together in large bowl Stir in flour, sugar, salt and baking soda. Add walnuts and blend. Add batter to pan and bake for 1 hour. Remove and cool on rack. F&P variation: Reduced sugar and added ½ C of homemade applesauce, also ½ tsp vanilla flavoring, and ¼ tsp cinnamon and nutmeg. Today's big farm news is that the TOMATOES ARE UP!!!!!! Out of the 12 we are starting about 6 are up so far. There will be 6 each of Margarita Plums, Celebrit y and Rutgers plants. Last year we learned that this is all we really need for fresh fruit during the season and plenty for canning. We also learned to give them a lot of room. Tomatoes like any other plants, like to breather fresh air. By leaving enough space in between the buildup of oxygen is reduced and the flow of CO2 is increased. The final step is keeping them evenly moist which sounds much easier than it really is. Not wet and never dried out. This year we will more drip irrigation and paper mulch then ever before. This should allow us to grow much healthier fruits with less weeding and an easier time harvesting. Since it is Sunday, it is Safari Day. We are heading up to Pokomoke Md to Lowes and Tractor Supply with a stop along the way to see some friends. 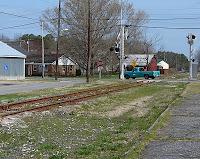 Tomorrow (since it is too wet to work here) will be a work day with VA Dept. of Conservation & Recreation helping to plant 2400 Wax Myrtle (Morella cerifera) shrubs at the Magothy Bay Preserve. Picture of that to come. 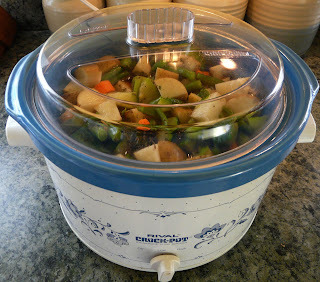 Like Grenville said earlier, it's been a damp, chilly and rainy day -perfect for crock pot stew - and a great way to use some of the frozen veggies from last season’s garden. F&P additions: cut up frozen zucchini, green beans, and turnips, canned mushrooms. And that is just what we have here today. Rain to the north, snow to the south, and slush in the middle. So what's wrong, meteorologically speaking, with this picture???? Beatrice and I have decided that this will be a snuggly day with some hot chocolate, banana bread, and left over stew. We may even watch a movie,,,,, right in the middle of the day even.